Dark brown or black feathers tipped with gray or buff white. Yellow bill. Short tail feathers. Walkers, not hoppers. Inhabit most of North America, often near people in cities and towns and on farms. Starlings gather in huge flocks and migrate moderate distances in fall, while in some areas they remain year around. Flocks forage for various seeds, fruits and crawling insects. They are fierce competitors of bluebirds and other song birds. Build nests of twigs, grass, feathers and hair in abandoned tree cavities and rock cliffs, building nooks and crannies, steeples, towers, eaves and bird houses if not evicted. Females lay about four to six pale greenish-blue or bluish-white eggs which hatch after about two weeks incubation and young leave the nest in about another three weeks. 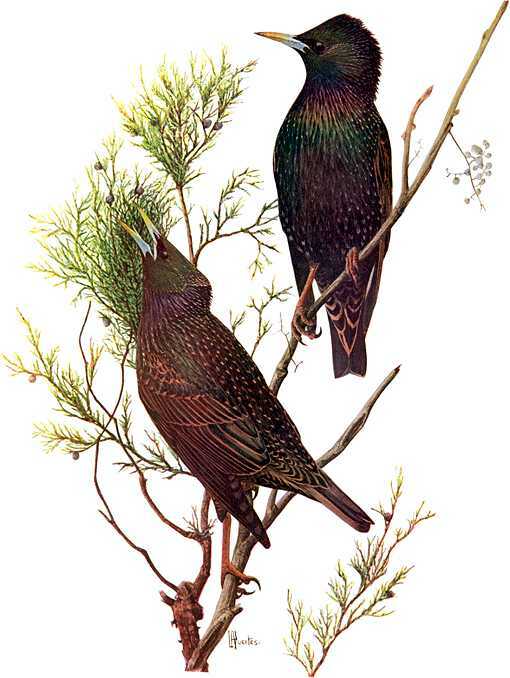 At one time, the European starling was a favorite caged bird because of its songs and ability to imitate sounds, which is probably why it was imported. The first flocks introduced in America did not survive. The sixty birds released by Eugene Schieffelin in Central Park in 1890 did survive. Flocks were observed around New York City shortly thereafter including some that moved into the Museum of Natural History and they remained year around. Inhabit most of North America, often near people in cities and towns and on farms. Starlings gather in huge flocks and migrate moderate distances in fall, while in some areas they remain year around. 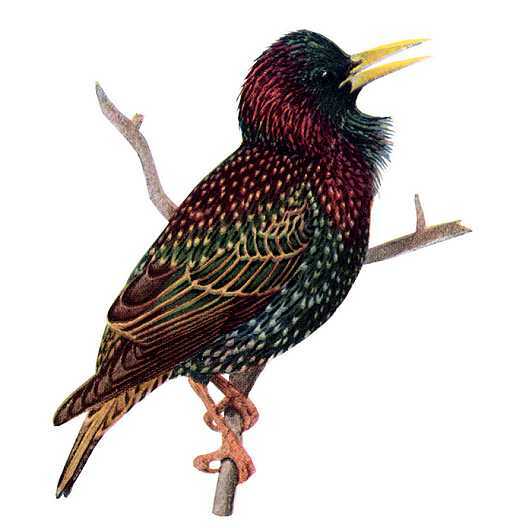 At one time, the European starling was a favorite caged bird because of its songs and ability to imitate sounds, which is probably why it was imported. The first flocks introduced in America did not survive. The sixty birds released by Eugene Schieffelin in Central Park in 1890 did survive.